Background: Hydatid cyst is a zoonotic and parasitic disease with worldwide distribution. Anticancer effects of hydatid cyst have been shown in cell culture experiments and animal model investigations. The mechanism of anti-cancer effects of hydatid cyst fluid has not been clearly elucidated, and the induction of apoptosis may have a role in this regard. Hence, in this study, the effect of hydatid cyst fluid (HCF) on the induction of apoptosis on mouse breast cancer (4T1) cell line in cell culture medium has been investigated. Materials and Methods: Echinococcus granulosus HCF antigens including Antigen B (AgB), glycolipid, glycoprotein, and 78 KDa fractions were prepared. Breast cancer cell line (4T1) was cultured in RPMI-1640 medium supplemented with 10% fetal bovine serum and appropriate antibiotics. 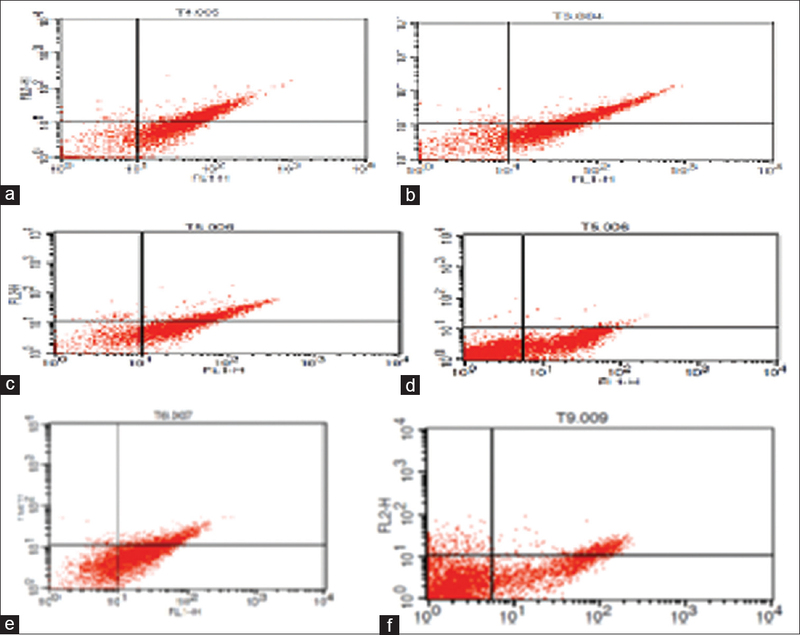 Apoptosis was determined by flow cytometry using the annexin V-fluorescein isothiocyanate apoptosis kit. Results: The 78 KDa and glycoprotein fractions induced more than 40% apoptosis. HCF and glycolipid antigens induced 39% and 34% apoptosis, respectively. However, less apoptosis observed after treatment with AgB fraction. Conclusion: Hydatid cyst antigens especially the 78 KDa and glycoprotein fractions induced apoptosis on mouse breast cancer cells. Hydatid cyst is the larval stage of the tapeworm Echinococcus granulosus (E. granulosus) which is in human and livestock viscera. The cyst is outwardly covered with a carbohydrate-rich material termed laminated layer. The hydatid cyst fluid (HCF) of E. granulosus is a complex of biological mixture of glycoprotein and glycolipid, carbohydrates, cyclophilin, and ferritin. Breast cancer is the second leading cause of cancer death among women and is the most common malignancy in women accounting for 1.2 million new cases annually. First-line treatment options are surgery, radiation, hormonal therapy, and chemotherapy. Moreover, nonselective cytotoxicity of chemotherapeutic agents causes adverse effects. Furthermore, drug resistance makes a weak prognosis in the treatment process., Therefore, searching for effective anti-cancer agents with higher efficiency and fewer side effects is important. Hence, in this study, apoptotic and necrotic features of HCF antigens on mouse breast cancer (4T1) cells has been investigated. HCF was collected from infected sheep lungs and livers at Fasaran slaughterhouse in Isfahan, Iran. From sheep hydatid cyst, the hydatid fluid was aspirated using a syringe and needle. After that with the observation of the protoscolices, the aspirated cyst fluids were centrifuged at 2000 × g, for 2 min and the supernatant was air dried and stored at −20°C as crud hydatid fluid antigen. A sample of CHF with 2 mg/ml concentration was purified by gel filtration chromatography in a column on Sephadex G 200 (1.5 cm diameter and 60 cm in length) in phosphate buffered saline (PBS) (pH 7.2), at a flow rate of 20 ml/hour. The elutes were collected and pooled together. 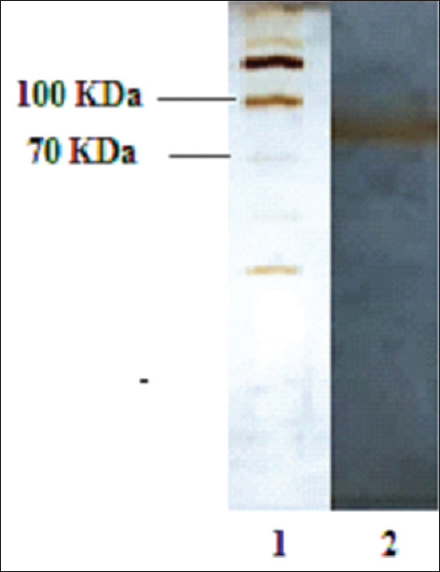 The protein concentration determined by bicinchoninic acid protein kit. The purified fractions were then analyzed in sodium dodecyl sulfate-polyacrylamide gel electrophoresis (SDS-PAGE), (12.5%) according to Laemmli method with some modification. The gel was then stained with silver stain. Molecular weights were determined by standard protein markers (PMW-M, Bangalore Genei). The antigen B (AgB) of HCF fraction was prepared according to the previously described method. Briefly, 50 mL tubes containing HCF were centrifuged at 1500 g for 15 min. The supernatant was then dialyzed against 0.005 M acetate buffer (pH = 5) overnight at 4°C and centrifuged at 5000 g for 30 min. Then, the precipitate was dissolved in 10 ml of 2M phosphate buffer (pH = 8). The preparation was saturated with 5 mL ammonium sulfate 40% and mixed for 1 h and centrifuged at 5000 g for 15 min. The supernatant was incubated in water bath for 15 min and centrifuged at 5000 for 30 min. Finally, the supernatant containing the Ag B was collected and stored at −70 c until use. The glycoprotein and glycolipid of HCF were prepared by chloroform-methanol extraction. Distilled water, methanol, and chloroform were added to the crude HCF with 3:4:1:1 ratio, respectively and centrifuged for about 5 min at 5000 g. The pellet was then resuspended in 4 ml methanol and centrifuged at 5000 g for 20 min. After discarding the supernatant and resuspension of the pellet, the lower section of the tube was obtained as the glycoprotein fraction and the supernatant as the glycolipid fraction. Breast cancer cell line (4T1) was obtained from the National Cell Bank of Iran (Pasteur Institute, Tehran, Iran). Cells were cultured in RPMI-1640 medium supplemented with 10% fetal bovine serum, 100 ng/mL of streptomycin and 100 units/mL of penicillin and kept at 37°C in a 5% CO2 incubator. By using the annexin V-fluorescein isothiocyanate (V-FITC) apoptosis kit (eBioscience, USA) apoptotic rate was determined by flow cytometry. The rate of apoptotic cells was estimated by green fluorescence emitted by annexin V-FITC bound to phosphatidylserine exposed to the outer leaflet of the apoptotic cell membrane. After extensive washing in PBS, 1 × 106 cells were rinsed with HEPES buffer, re-suspended in the same buffer, and incubated at room temperature for 5–15 min in the dark and then annexin V-FITC (5 μl) was added. To detect necrotic cells, PI was then added to the cell suspension before the analyzing by a FACS equipment (BD Biosciences, San Jose, CA, USA). Data were expressed as mean ± standard deviation from three independent experiments. Statistical analysis was performed using ANOVA and Student's t-tests, and the differences were considered statistically significant at P < 0.05. Results of gel filtration chromatography of HCF showed two peaks [Figure 1]. In the first one (peak 1), the protein concentration was 600 μg/ml, but in the second one (peak 2) the main constituent was urea. SDS-PAGE analysis of the proteins in peak 1 showed that a band with a molecular weight of about 78 KDa [Figure 2]. 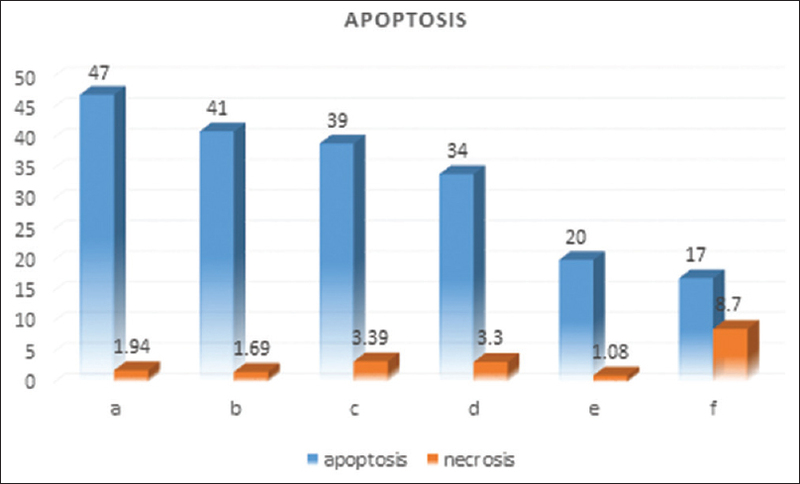 The effects of different antigens of hydatid cyst on the induction of apoptosis and necrosis were estimated following 48 h after the treatment of breast cancer cells with hydatid cyst antigens. The 78 KDa fraction of HCF induced 46.5% apoptosis. Glycoprotein fraction and crude HCF induced 41% and 39% apoptosis, respectively. Glycolipid fraction induced 34% apoptosis and 20% apoptosis observed following treatment with AgB. In the control group (nontreated cells), 17% apoptosis was also observed. However, no obvious amount of necrosis was seen following treatment of breast cancer cells with hydatid cyst antigens. The results of apoptosis and necrosis induction by different hydatid cyst antigens have been summarized in [Figure 3] and [Figure 4]. Results of this work indicated that HCF crude antigen; the 78KD, and glycoprotein fractions induced apoptosis on breast cancer cells.In vitro and in vivo studies demonstrate that some parasite has anticancer effects. In this context, it has been shown that hydatid cyst protoscolices induce cell death in WEHI 164 fibrosarcoma cells. Also, the inhibitory effect of different hydatid cyst molecules on Hela and Vero cell lines has been shown. In another studies, HCF reduces the growth of melanoma tumor in C57/black mice. Furthermore, antitumor activity of human HCF in a murine model of colon cancer has been shown. Karadayi et al. show that hydatid disease has protective effects against lung cancer. How hydatid cyst-induced cell death and associated signal pathway of apoptosis are not clear. It was previously shown that hydatid fluid toxins have fatal effects on mouse peritoneal macrophages. Thus, apoptosis pathways may be activated after exposure to hydatid fluid by secreted toxins of the protoscoleces. In an investigation, it has been shown that hydatid cyst induced apoptosis through increased Bcl-2 family levels. Cytotoxic features of E. granulosus has previously been shown. In an investigation, it has been shown that in lymphocytes that were treated by fertile hydatid fluid apoptosis rate was significantly higher in comparison to nontreated cells. In the treated lymphocytes, expression of the Bax gene as a pro-apoptotic molecule was increased and the expression level of Bcl-2 mRNA as an anti-apoptotic molecule was decreased. The activity of caspase-3 was also significantly higher in the hydatid cyst-treated group. All these support this concept that antigens of protoscolices of E. granulosus HCF induce apoptosis in the lymphocytes of hosts. However, in a research work done by Janssen et al., it was demonstrated that some toxic substances of the protoscolices, may reduce the viability of the macrophages in vitro. Nono et al. demonstrate that excretory/secretory secretions of Echinococcus multilocularis (E. multilocularis) cyst induce apoptosis in dendritic cells in vitro. In another work, Emp53 was identified from E. multilocularis and was shown that this molecule has apoptosis and the oxidative stress effects. In conclusion, our results confirmed that some antigens of hydatid cyst fluid induce apoptosis in 4T1 cells. Hence, HCF may be a curative material to induce apoptosis in cancer cells. However, the molecular mechanisms associated with the anti-apoptosis of hydatid antigens have not been clearly elucidated. More researches are recommended to understand molecular mechanisms of apoptosis induced by the parasite. This work was supported by grant from Isfahan University of Medical Sciences, Isfahan, Iran. Aziz A, Zhang W, Li J, Loukas A, McManus DP, Mulvenna J, et al. Proteomic characterisation of Echinococcus granulosus hydatid cyst fluid from sheep, cattle and humans. J Proteomics 2011;74:1560-72. Cabrera G, Cabrejos ME, Morassutti AL, Cabezón C, Orellana J, Hellman U, et al. DNA damage, RAD9 and fertility/infertility of Echinococcus granulosus hydatid cysts. J Cell Physiol 2008;216:498-506. Paredes R, Jiménez V, Cabrera G, Iragüen D, Galanti N. Apoptosis as a possible mechanism of infertility in Echinococcus granulosus hydatid cysts. J Cell Biochem 2007;100:1200-9. MacIntyre AR, Dixon JB, Green JR. Growth kinetics of leukocyte cell lines cultured with hydatid fluid of Echinococcus granulosus equinus. Parasite Immunol 2000;22:651-7. Macintyre AR, Dixon JB, Green JR. Mitosis and differentiation in T-cells under cytotoxic action of Echinococcus granulosus hydatid fluid. Vet Parasitol 2001;96:277-89. Yousofi Darani H, Soozangar N, Khorami S, Taji F, Yousofi M, Shirzad H, et al. Hydatid cyst protoscolices induce cell death in WEHI-164 fibrosarcoma cells and inhibit the proliferation of baby hamster kidney fibroblasts in vitro. J Parasitol Res 2012;2012:304183. Aref N, Shirzad H, Yousefi M, Darani H. Effect of different hydatid cyst molecules on hela and vero cell lines growth in vitro. J Immunodefic Disor 2012;2:3. Chookami MB, Sharafi SM, Sefiddashti RR, Jafari R, Bahadoran M, Pestechian N, et al. Effect of two hydatid cyst antigens on the growth of melanoma cancer in C57/black mice. J Parasit Dis 2016;40:1170-3. Berriel E, Russo S, Monin L, Festari MF, Berois N, Fernández G, et al. Antitumor activity of human hydatid cyst fluid in a murine model of colon cancer. ScientificWorldJournal 2013;2013:230176. Parkin DM, Bray F, Ferlay J, Pisani P. Global cancer statistics, 2002. CA Cancer J Clin 2005;55:74-108. Sharifi S, Barar J, Hejazi MS, Samadi N. Roles of the Bcl-2/Bax ratio, caspase-8 and 9 in resistance of breast cancer cells to paclitaxel. Asian Pac J Cancer Prev 2014;15:8617-22. Ghanbari P, Mohseni M, Tabasinezhad M, Yousefi B, Saei AA, Sharifi S, et al. Inhibition of survivin restores the sensitivity of breast cancer cells to docetaxel and vinblastine. Appl Biochem Biotechnol 2014;174:667-81. He F. BCA (Bicinchoninic Acid) Protein Assay. Bio Protocol Biol 2011;101:e44. Laemmli UK. Cleavage of structural proteins during the assembly of the head of bacteriophage T4. Nature 1970;227:680-5. Shirazi S, Madani R, Hoghooghi Rad N, Bahadori R. Isolation and purification of Echinococcus granulosus antigen B from hydatid cyst fluid using three different methods. Arch Razi Instit 2016;71:103-8. Rieger AM, Nelson KL, Konowalchuk JD, Barreda DR. Modified annexin V/propidium iodide apoptosis assay for accurate assessment of cell death. J Vis Exp 2011. pii: 2597. Karadayi S, Arslan S, Sumer Z, Turan M, Sumer H, Karadayi K, et al. Does hydatid disease have protective effects against lung cancer? Mol Biol Rep 2013;40:4701-4. Janssen D, De Rycke PH, Osuna A. Dose-dependent effects of hydatid fluid toxins from Echinococcus granulosus on mouse peritoneal macrophages. Folia Parasitol (Praha) 1993;40:109-13. Mokhtari Amirmajdi M, Sankian M, Eftekharzadeh Mashhadi I, Varasteh A, Vahedi F, Sadrizadeh A, et al. Apoptosis of human lymphocytes after exposure to hydatid fluid. Iran J Parasitol 2011;6:9-16. Janssen D, Osuna A, Lazuen J, de Rycke PH. Comparative cytotoxicity of secondary hydatid cysts, protoscoleces, and in vitro developed microcysts of Echinococcus granulosus. J Helminthol 1992;66:124-31. Nono JK, Pletinckx K, Lutz MB, Brehm K. Excretory/secretory-products of Echinococcus multilocularis larvae induce apoptosis and tolerogenic properties in dendritic cells in vitro. PLoS Negl Trop Dis 2012;6:e1516. Cheng Z, Zhu S, Wang L, Liu F, Tian H, Pengsakul T, et al. Identification and characterisation of emp53, the homologue of human tumor suppressor p53, from Echinococcus multilocularis: Its role in apoptosis and the oxidative stress response. Int J Parasitol 2015;45:517-26.